Our renowned expert, Louise Arthur spends considerable time over the winter months gathering and harvesting materials from hedgerows and gardens for your exclusive use. We feel spoiled as she doesn’t do this for any of her other courses! This day is a celebration of the many plant materials growing in our hedgerows, woodlands and gardens which we can use to make frame baskets of great beauty. 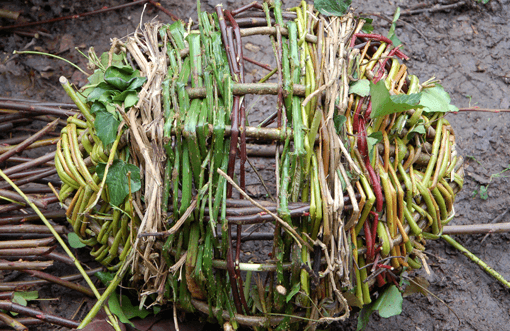 A truly sensory course working with natural hand foraged materials such as willow, dog wood, ivy and hazel. 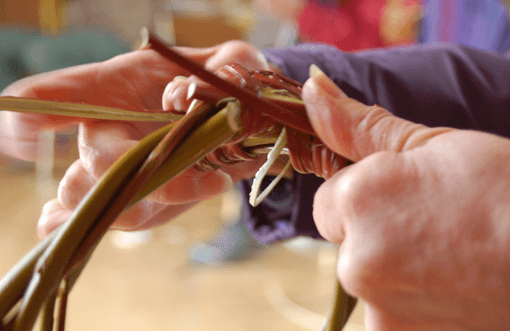 Each material has its own unique properties, texture, smell and colour and with the patient, expert tuition from Louise you will go home with a beautiful woven frame basket. No previous skills necessary, although some manual dexterity and patience will be needed. Bring sharp secateurs if you have them and wear old trousers. Bring a packed lunch and we will provide drinks and cakes throughout the day. Bring a packed lunch and we will provide drinks and delicious cakes throughout the day.